My TBR pile had no holiday reads so for December’s challenge, I chose Murder On Ice by Alina Adams. Nothing says “Merry Christmas” like a figure skating judge electrocuted under mysterious circumstances and a cable TV researcher intent on finding out whodunit. I was drawn to this cozy mystery series after I was a guest on the author’s blog, because we both write books set in the world of figure skating. My skaters fall in love, hers are murder suspects, but sports are sports. 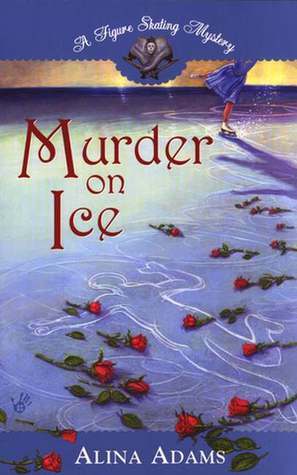 This book, the first in Adams’ Figure Skating Mystery series was published in 2003. Murder On Ice begins with Russian skater Xenia winning gold at the World Figure Skating Championships over perky American teenager Erin. Before you can say “wuz robbed,” the Italian judge whose score put Xenia atop the podium turns up dead. TV researcher Rebecca “Bex” Levy’s boss assigns her to do a story on the murdered judge, and while she’s at it, to find the killer. Adams worked as a figure skating researcher and included a lot of great behind the scenes detail about figure skating broadcasts which I really enjoyed. I also liked the colorful cast of characters, from Erin’s obsessed fans, to the vaguely sinister Russians, whose suspicious behavior may simply be because everyone quickly assumes they’re guilty, and the bickering, bitchy skating commentators on Bex’s 24/7 Network. The story relied heavily on Y2K tech, such as multi-colored floppy discs, travel printers (wired, naturally), dial-up Internet and flip phones. Characters use pay phones, and talk about being on the “world wide web.” One suspect’s alibi rests on the fact she doesn’t know how to print an email. Technology wasn’t the only throwback aspect to Murder On Ice. Bex’s narration is full of random asides which were sometimes humorous, but had a rambling quality far different from the lean and mean style more prevalent today. It wasn’t bad necessarily, but it was a little odd. And while Bex is an extremely amateur sleuth, it surprised me that she would openly confront her suspects with potentially incriminating evidence. I’m not a big cozy mystery reader, but I don’t recall Nancy Drew playing so fast and loose with clues. So overall, the skating and prehistoric tech were fun, the sleuthing confusing, and I’m undecided on Bex. But if another Figure Skating Mystery finds its way to my TBR pile, I’ll happily give it a read.